Branding is a vital, but often undernourished part of marketing strategy. From experience, branding often does not get the support it needs due to the murky area of KPIs and tangible outcomes from a brand campaign. These lie in a different realm to content syndication or events which typically lend themselves towards observable pipeline or sales impact. As a result, starting a brand campaign can be tough, as it's hard to even know what success would look like, or how it would be measured. So hey, here's a headache saver; we've constructed a Brand Campaign Cheat Sheet, establishing how to identify, measure and understand the key metrics for a brand campaign. So I would guess that some of this looks very familiar, some of it looks kind of familiar, and some of it might be completely foreign. Reach - Advertising Visibility in front of target audience. 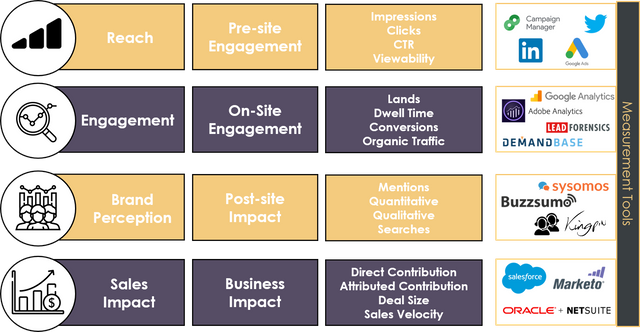 Pre-Site is usually the easiest metric to measure and analyse for short term, tangible impact of activity. However, what it actually reveals about the success of a campaign is limited in scope. As a metric, it will be useful for day-to-day understanding of top-line performance; but most of these terms will mean little to anyone outside of your marketing team. Kingpin Tip: Industry average CTR ranges from 0.04% to 0.07% for a standard display banner; and viewability is normally cited as 52% to 57%. These are always worth bearing mind, but it's worth remembering how these metrics can be influenced by your strategic approach, and what limitations benchmarks sometimes face. 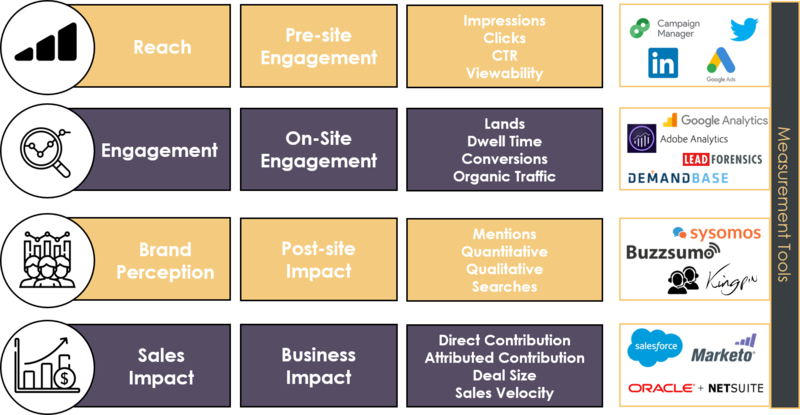 Commonly used related terms: “Traffic", "Engagement", "Interest"
Engagement is where we start to get into meatier metrics; the ones that resonate beyond marketing and into more senior levels of your marketing team. Traffic, conversions, dwell time, these are all metrics that can easily be understood by sales, and begin to build a picture of some tangible return from a brand campaign. However, they require a keen eye to spot interesting patterns, and the stats are unlikely to be interesting at a board level without a comprehensive understanding of what they mean. Kingpin Tip: Knowing your site analytics platform here is vital. The better you're able to navigate your system, the better equipped you'll be to dig in and uncover the true story behind surface level insights. Brand Perception - User perception and discussion of your brand. Commonly used related terms: "Shift in perception", "Re-positioning", "Conversation"
Now we're cooking with gas. These metrics are where we really hit the core of branding, and discover whether we've been talking to our audience, or at them. Analysing them correctly will begin to add some real meat on the bones of what marketing gets up to, and how it supports the business. Kingpin Tip: Firstly, be prepared for some ugly truths. If you haven't run this exercise recently (or ever), be prepared for the fact you may be less well known or thought of than you thought. However, bear in mind that any feedback from your audience (good or bad) is going to be productive. Secondly, make sure you're asking the right questions and (where possible) studying the same audience you've been focusing on. If you've been laser-targeted on engaging financial services, you are unlikely to learn much from a survey primarily composed of manufacturing respondents. Commonly used related terms: "ROI", "Sales", "Pipeline"
Business Impact is something that all stakeholders are going to understand and find resonant. However, it's also one of the most difficult to approach thoroughly. In honesty, it's an area which very few businesses have down pat. Opening up doors for larger deals that a less trusted brand would not have access to. Reducing sale time where prospect organisations need less time for further research as they already understand your offering meets their needs. Kingpin Tip: This is something that takes time and data to analyse fully. Depending on your existing sales cycle it is unlikely that you will gather enough sales data over a quarter to define some solid change. As a result, this should be looked at on a macro level, but consistently. You can't run a successful brand campaign unless you know what success looks like. At Kingpin, we believe in starting from the bottom up and tracking throughout the process to demonstrate and understand the effects of a brand campaign and its tangible and measurable business impact.